Tilo is one of the Kokiri spirits living in the Forest Temple. She's mischievous, witty and might as well be a troll. Back in the days when the Kokiri Tribe still existed she hung around with Skull Kids a lot. As such, she's quite a thief herself and will try to be as problematic as possible for Link while he navigates the temple. She'll taunt him, close doors on him, break bridges, steal from him and from time to time bring other Kokiri spirits to play. 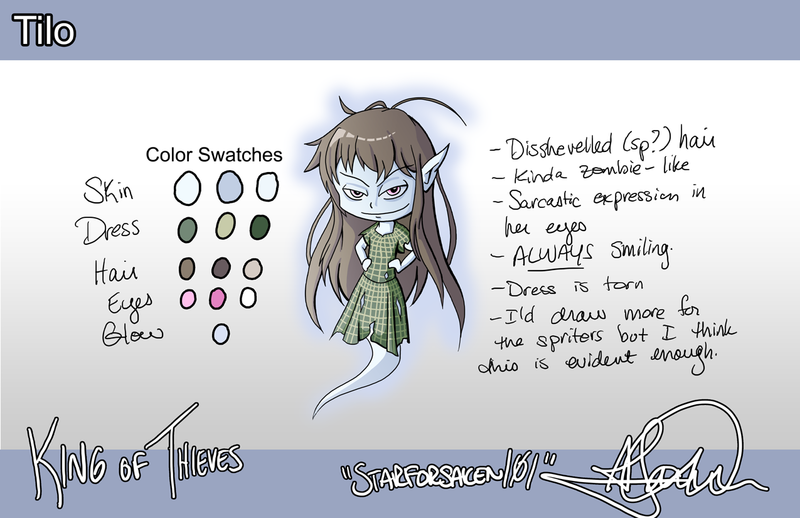 She's much less angry and bitter than the other spirits however and is really just playing around. She appears as a ghost with things typical of the Kokiri spirits. Torn clothes, messy hair, pale skin and almost zombie like, yet still has a creepy smile on her face. As much as she tries to hinder Link, he'll actually find her useful by tricking her into activating switches and such to allow him to go deeper into the temple. 1. Chase the boomerang around and catch it before it can get to your target. She'll drop it back on your head. 2. Destroy bridges, forcing you to either solve a puzzle to find a replacement bridge or find a way around. 3. Lock you into certain rooms. 4. Throw Deku Nuts at you. 5. Call other Kokiri Spirits (the angry kind) to "play" with you. 6. Steal items and rupees before you can pick them up. 7. Move hookshot targets while you're trying to shoot them. 8. Deactivate/activate switches. In certain situations, the player will be able to get her to do one of the above (depending on the puzzle at hand) to actually help themselves get further in the dungeon. For example, you may get her to drop Deku Nuts on an invincible enemy, making it now able to be defeated. It may also be possible to trick her into flipping a switch that's out of your reach. In some cases, the player will have to temporarily remove her from the room (by locking her in a room, scaring her off, confusing her etc) in order to complete a puzzle. On a side note, she does NOT like the hookshot. This page was last modified on 27 February 2013, at 13:47.